Ayushmann Khurrana had an excellent 2018 what with the success of his film Andhadhun. Ever since, the actor has been working on some great projects and his upcoming film will have him play the role of a cop in Article 15. The Anubhav Sinha film also has a strong supporting cast of Isha Talwar, Manoj Pahwa, Sayani Gupta, Kumud Mishra, M Naser, Ashish Verma, Sushil Pandey, Subrajyoti Bharat and Zeeshan Ayub. The film has now wrapped up its shoot and Ayushmann seems to be thankful to the makers for giving him the opportunity to star in this film. Looks like the team was so impressed by the actor that they even gifted him a 3D mini model of his character from the film. Ayushmann Khurrana Starrer Andhadun Works Magic on the Chinese Audience! Talking about wrapping up the film, Ayushmann tweeted saying, "Wrapped up a film which will become the most relevant and important film of Indian cinema. Thank you @anubhavsinha sir for giving me this gem and also writing the most real cop role ever." He also shared a picture of the 3D model and wrote, "Thanks to the entire cast and crew, esp #RonjiniChakraborty and @Ashishsverma for this wonderful 3D mini model of mine. Love. It’s a wrap! #Article15." 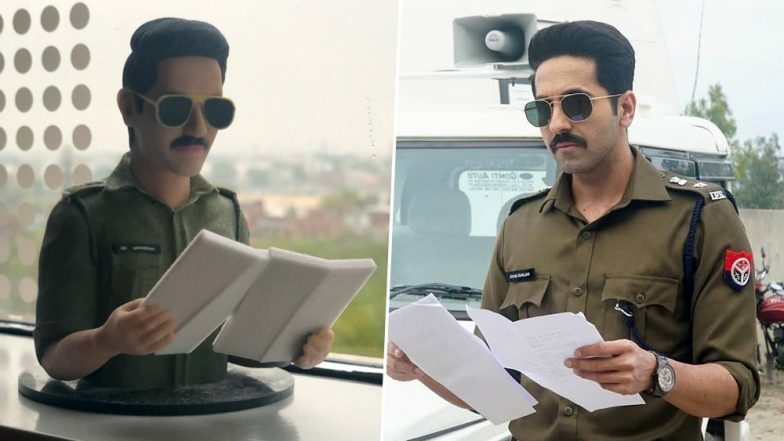 Ayushmann Khurrana to Play Policeman in Anubhav Sinha's 'Article 15'. Earlier, speaking about working with Anubhav Sinha, Ayushmann had said, "I'm always intrigued by the socio-political situation of our country. We hardly see films which present the situation in an unbiased way. Anubhav Sinha is one such director who understands the complexities of our country. I loved 'Mulk'. It is the most balanced film based on communalism and extremism. And it will be an absolute pleasure to work with him on 'Article 15."